Saves vendor invoices (or "vouchers") as open payables; reports these based on due and discount dates (so you can take advantage of all available discounts); facilitates paying, either in fule or partially; passes information for check generation to our CheckWriter application. Here's the initial screen that comes up after launching our Accounts-Payable application. At the top are the key pieces of payable information, amounts, due and discount dates. 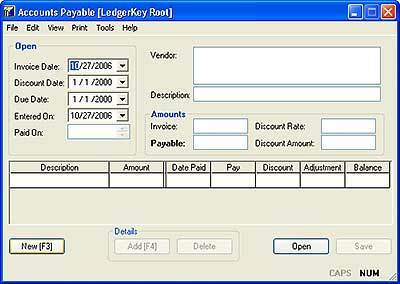 The grid in the middle of the window allows you to break out the invoice details, such as for general-ledger accounting and so that you can pay only certain items or groups of items from the invoice. There are an unlimited number of detail lines, so you can actually show individual items if you like. You can mark an invoice for payment by retrieving and editing it. Click Open (or choose File>Open) and select the open invoice from a scolling list. You can look at invoices for a single vendor and/or a range of date criteria. With the invoice on the screen, just press F5 to mark all the lines of the invoice (or press again to deselect). Or, you can choose View>Pay Amount to reveal the payment column for the invoice and enter any amount for any line. You start the selection process for paying a batch of invoices by selecting File>Select For Payment (or press F8). The application will open a window showing you a group of open payables like this. 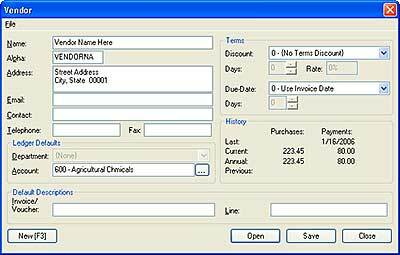 The default criteria for which invoices are included are "all vendors" and cutoff discount and due dates. (You can change these as application settings.) You can look at individual vendors. You can change the range of cutoff dates. You can just move the highlight up and down the list and press Spacebar or F7 or choose File>Select This Invoice to select (or deselect) individual invoices. Or you can press F3 (or choose File>Select All from the keyboard) to select all the invoices in the group. You can select and deselect all the invoices for a single vendor with F5 and/or F6. Click Save to save your choices. This gives a very visual method to easily browse through open payables and mark invoices for payment. 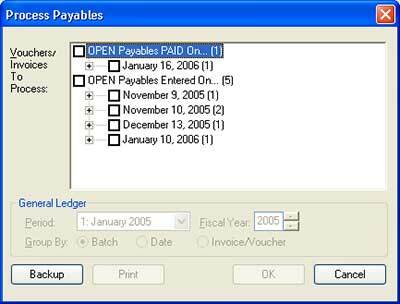 The next step in payables-batch routine is to print a list of the current selections. You can do that directly from the selection window by clicking Print (of choose File>List Selected Invoices/Vouchers). Or you can choose File>List Selected Invoices/Vouchers) from the main window. It's always a good idea to print a hard copy of what you are about to process, but that is optional. Finally, you process invoices for payment by choosing File>Process (or pressing Ctrl+F8). 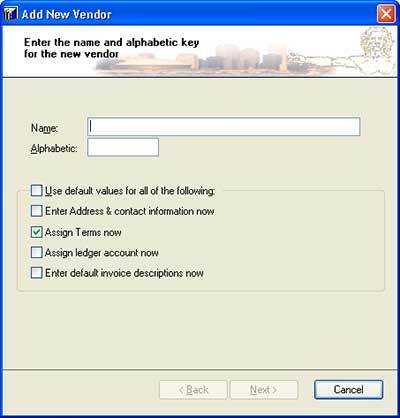 "Processing" means two things here: Passing payment information to our CheckWriter module (to create a vendor check) and marking the invoice, either partially or fully, as "paid"; and, if you are using our applications to handle your general-ledger work, creating groups of journal entries in the general-ledger database. You just check of the groups of invoices -- or individual invoices -- and (optionally) specify a couple of criteria for the ledger work, and that it! Ths literally takes only a few seconds.